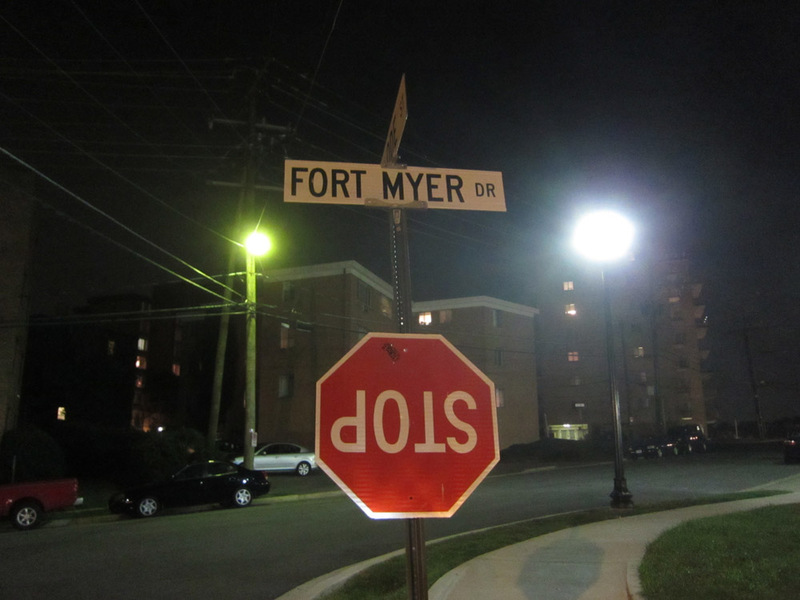 A "dois" sign has appeared at the corner of Fort Myer Dr. and Ode Street in Rosslyn. Three years ago, the Ode Street Tribune reported a sign that Ode Street was going downhill at this location. However, that sign turned out to be faulty. This new sign is difficult to read. The Tribune does not believe it to be ominous, but has committed the full staff of its investigative reporting division to get to the bottom of this story. Additional bonus news: Be careful taking a left turn from Nash St. onto the small Arlington Blvd. View distance to the left is short because of the slight bend in the road. Moreover, the small Arlington Blvd to the left is a pillar of county speeding ticket revenue. So expect some cars with uninformed drivers to be going quite fast. It speaks to the existential nature of Rosslyn. "Dois" is the first person indicative singular of "devoir" which means, as a verb, "must." In Rosslyn, you must, but you are free to must as you will. This explains so much.